It is another full day today, beginning with a visit to yet another souq: the Nizwa Souq. This souq is perhaps the most interesting of them all, since it is huge, and offers an amazing variety: cattle and goat market, butchered meat, fruit and vegetables, silver jewelry (especially silver khanjars – traditional daggers of Oman) and crafts. The Halwa shop (Omani sweets) is undoubtedly the busiest place in the whole souq. However, there are no camels at this livestock sale. In addition to the large number of locals, there are lots of tourists at the souq…and everyone arrives early! I have lots of time to people watch, and yet I see only one woman the whole time I’m there. Omani men (and their sons) are doing the shopping, at least at the souq. Nizwa’s fort is on the edge of the souq. It was built in the 17th century, and dominates the city with a 40 metre (125 foot) high huge round tower. I walk the back streets to see where the residents live. It is considerably quieter away from the souq, and the city appears to be very well developed, and offers its residents a good quality of life. After leaving the souq, we visit the oasis village of Al Hamra, at the foot of the Hajar Mountains. This village is one of the oldest in Oman, and has a well-preserved row of two- and three-story mud-brick houses built in the old Yemeni style. We visit a traditional Omani house (Beit al-Safa) and have lunch in the oasis. After leaving the oasis, we climb 2,000 metres up the tallest mountain in Oman, Jebel Shams. 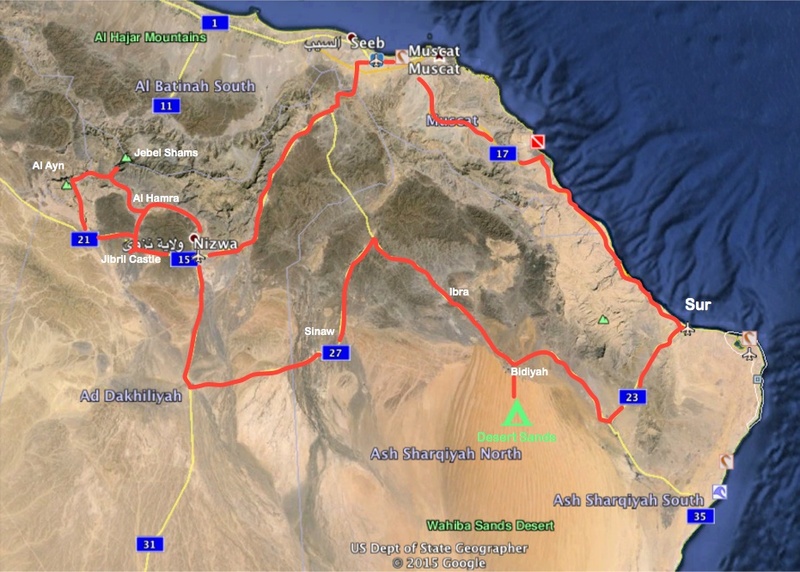 We are staying at Jebel Shams Resort, situated across the road from Wadi Ghul, the Grand Canyon of Arabia. This entry was posted in Oman and tagged canyon, highway, map, mountains, oasis, valley, wadi. Bookmark the permalink.